After you complete this assignment, email your github user name to me at rblack@austincc.edu. Be sure to include “HW1” in the subject line to receive credit. This is the only assignment you will submit by email! In this step, you will be creating a directory (folder for you Windows folks) where all homework assignments will be “submitted”. Actually, submitting any assignment in this course will involve making sure your work shows up on GitHUb. Exactly how you will do that is something we will go over in class. For now, just follow along. Make sure you click on the link for your section! 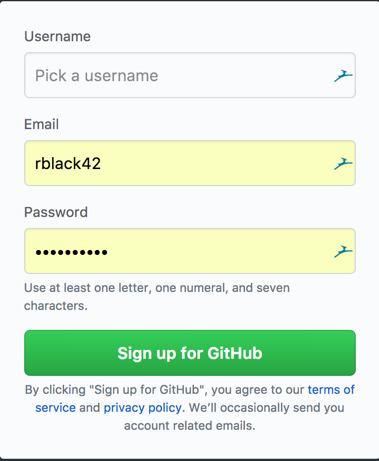 Use your section number on the link, and your GitHub_username.